What would it take for you to move the world? If you have enough motivation and enough support these is no reason why you cannot do great things. 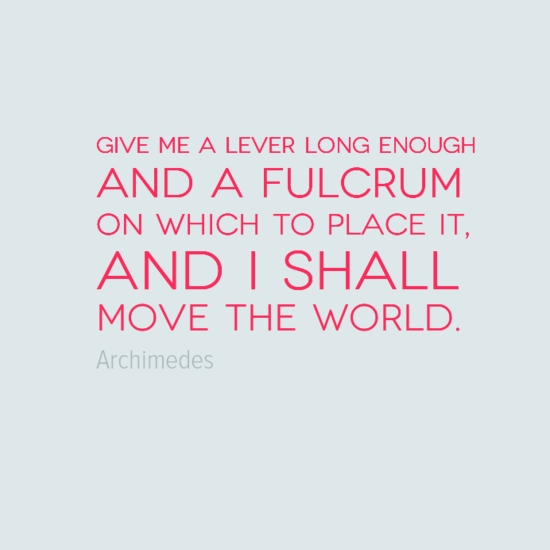 Archimedes was a mathematician, physicist, engineer, inventor, and astronomer. Born in Sicily in c.287 BC few details are known about his life – although he is widely regarded as one of the leading scientists in classical antiquity. His discoveries included the Archimedes Principle and the Archimedes Screw. The Archimedes Principle relates to a method for determining the volume of an object with an irregular shape. Legend has it that while taking a bath, Archimedes noticed that the level of the water in the tub rose as he got in, and realized that this effect could be used to determine the volume of an object. He found that by dividing the mass of the object by the volume of water displaced, the density of the object could be obtained. Archimedes was stated to be so excited by his discovery that he took to the streets naked, crying “Eureka!” (meaning “I have found it!”). 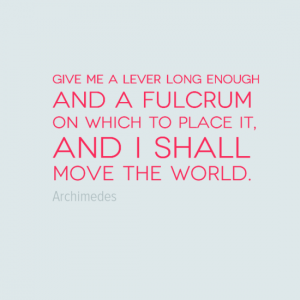 In addition to his discoveries, Archimedes is considered to be one of the greatest mathematicians of all time. He used the method of exhaustion to calculate the area under the arc of a parabola with the summation of an infinite series, and gave a remarkably accurate approximation of pi. He also defined the spiral bearing his name, formulae for the volumes of solids of revolution, and an ingenious system for expressing very large numbers.